Here's what the jury in the Nicholas Butcher murder trial heard. Kristin Johnston, a 32-year-old Halifax yoga teacher, was found dead March 26, 2016, at her home in the Purcells Cove area on the outskirts of the city. Nicholas Jordan Butcher, 36, is on trial for second-degree murder in his girlfriend's death. He has pleaded not guilty. The trial is scheduled to run for 20 days. Here's a summary of the evidence and testimony so far. This article will be updated as the trial progresses. In her opening remarks to the jury, Crown attorney Tanya Carter said she intends to prove Johnston wanted to break up with Butcher and she had no desire to return home the night before her death. Two of Johnston's friends testified that she broke up with him in the hours before her death. Carter alleges Butcher "couldn't be without Kristin Johnston," killed her and tried to take his own life. The prosecutor also tells the jury the medical examiner found Johnston died of 10 sharp-force wounds to her neck. Johnston was in a relationship with Butcher and the jury has heard they were dating for about a year. About a month before her death, Johnston, who is originally from Montreal, started closing her Halifax yoga studio, Bikram Yoga, because of money troubles. Friends of Johnston have testified she was stressed out about shutting down her business and was also considering ending her relationship with Butcher. In the weeks before her death, Johnston told friends she intended to sell her house in the Halifax area and move to Tofino, B.C., to help her pregnant sister. The jury has heard she spoke to multiple friends in the weeks leading up to her death about how she should break up with Butcher. Butcher is a Dalhousie law graduate who also has a bachelor of arts and a master's degree. The court has heard he was unable to get an articling job after graduation and was working as a driving instructor. He told the court he was $200,000 in debt from school. The jury heard text messages read aloud in court where Butcher said to his landlord how "stressed out" he was over his inability to pay rent on time. Butcher testified in his own defence in the third and fourth weeks of the trial. He reviewed a series of messages between himself and Johnston in the days and weeks before her death. Those messages were in contrast with evidence heard earlier in the trial from Johnston's friends, who said she was unhappy in her relationship and was considering breaking up with Butcher. The messages detail loving exchanges between the two. Butcher read a series of messages from Johnston in Florida in which she refers to him as "dear," "love" and "adorable." He said Johnston told him of her plan to go to Costa Rica while she was in Florida and he said he encouraged her to go for a vacation. Butcher read aloud to the jury several messages where he and Johnston discussed how much they missed one another. He read a text message to the court in which Johnston wrote that she wishes he was with her on the beach. Other text messages presented in court from Butcher to a friend say that he and Johnston broke up in November 2015. The jury heard the couple had broken up between Nov. 19 and Dec. 12, getting back together just before Johnston went home to Montreal for Christmas. At the end of the trial's third week, Butcher told the jury his version of events leading up to Johnston's death. Much of his testimony of the events that took place early in the evening matches what the jury has heard from other witnesses. However, Butcher told the court that Johnston didn't break up with him that night. He testified that on the evening of March 25, Johnston told him she was going out with friends for a drink. He said he left the house a short time later to go to his friend Adam Chisholm's house where he planned to spend the night. Butcher said after his friend Chishlom went to sleep, he drove from the north end of Halifax to Johnston's house on the outskirts of town to get cigarettes. He said he heard loud music playing from her computer. When he went to shut it off, he found her Facebook page was open and started reading her private messages. He saw one from a man he didn't know, Mike Belyea. He told the jury the messages had Belyea's address and he said he thought it was a party invitation so he went to Belyea's house. Butcher testified he found Johnston, Belyea and her friend Lisa Abramowicz inside. Butcher told the court Johnston asked him to leave and told him they'd talk the next day, contradicting testimony from Belyea and Abramowicz who said earlier in the trial that Johnston broke up with Butcher at that time. Butcher left, but waited outside for nearly two hours. He told the court he was going to offer her a drive home. When he saw Abramowicz leave at about 4:15 a.m., he called Johnston three times in a matter of minutes. When she didn't answer, he climbed the stairs to Belyea's apartment and heard Johnston moaning. Butcher said he could see Belyea lying on top of Johnston on his bed so he went in and pushed Belyea off. Belyea left the house to get cigarettes. Butcher said Johnston kept asking him what he was doing there. Butcher suggested they go home. He said Johnston got dressed and left with him. According to Butcher's testimony, he and Johnston had gone to bed cuddling at her Purcells Cove-area home early on March 26, 2016. 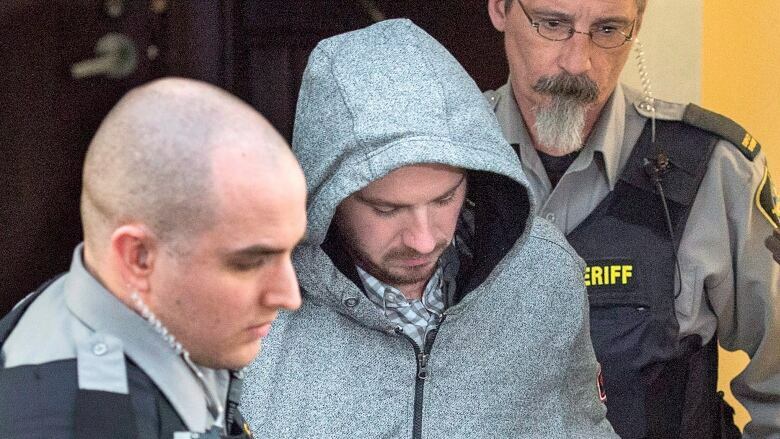 He told the Halifax jury he awoke when someone climbed on his chest and started stabbing him in the throat. Butcher said he flipped his attacker over, seized the knife and stabbed the person. Only after he turned on the bedside lamp did he realize it was Johnston, he told the court. "I checked to see if she was breathing and she wasn't. I went hysterical," Butcher told the jury, sobbing. "I'd just killed her by accident. I have to die too." Butcher testified he stabbed Johnston four times. The medical examiner found Johnston had been stabbed 10 times. Under cross-examination from the Crown in the fourth week of the trial, Butcher couldn't explain the discrepancy. Butcher testified that after stabbing Johnston, he took the knife and stabbed himself. When that didn't kill him, he said he went to the bathroom, got razor blades, slashed his wrists and lay down on the bed, waiting to die. Since that was taking too long, Butcher said he went to the basement and brought the mitre saw to the bedroom and cut off his right hand. Crown prosecutor Carla Ball noted on Friday that Butcher made no mention of an assailant attacking him when he called 911, nor did he say his girlfriend attacked him. He did tell the operator six times that he'd killed Johnston. Around 6 p.m. — Butcher's friend Adam Chisholm gets a text from Butcher asking him to hang out. 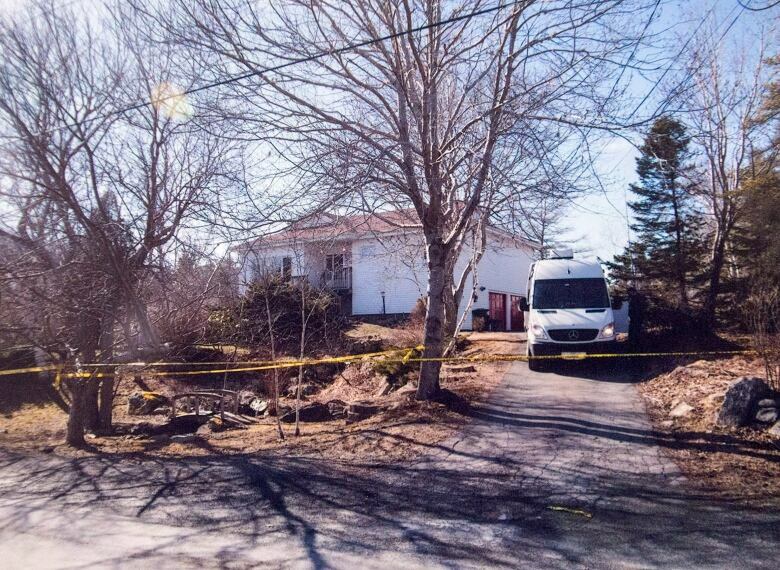 Around 8 p.m. — Butcher arrives at Chisholm's home in north-end Halifax with Johnston's dog. They talk about how Johnston seemed distant since returning from a recent trip to Costa Rica, as well as about Butcher's job prospects. Chisholm testified Butcher was "upset" at the prospect of Johnston ending the relationship. 8:05 p.m. — Johnston's friend Matthew Whiston meets her at the Halifax restaurant Lion and Bright. He testified Johnston was in good spirits. They talked about Johnston's trip to Costa Rica. They also talked about her failing business and her desire to end her relationship with Butcher. He said she appeared completely sober when he got there and estimates they each had two or three drinks. Whiston's girlfriend joins them. Other friends come and go. Around 11 p.m. — Johnston meets up with her childhood friend, Lisa Abramowicz, and leaves Lion and Bright. Abramowicz testified she and Johnston were both a little bit buzzed. The pair head to their friend Mike Belyea's house on Willow Street some time after 1:12 a.m. Some time between 12 a.m. and 1 a.m. — Chisholm falls asleep, under the impression that Butcher is spending the night. When Chisholm awakes around dawn, Butcher is gone but the dog is still there. Around 2:30 a.m. — Butcher shows up unexpectedly at Belyea's house, the jury has heard. Johnston seemed shocked but not scared. The pair leaves the apartment. A few minutes later, Johnston returns and tells Belyea and Abramowicz she ended her relationship with Butcher. The group concludes that Butcher was monitoring Johnston's Facebook Messenger and that's how he knew where to find Johnston. In his testimony, Butcher told the jury that when he showed up at Belyea's house that Johnston told him she was acting as "wingman" for her friend Abramowicz who wanted to hook up with Belyea. He did not say they broke up, contradicting testimony from both Belyea and Abramowicz. 3:26 a.m. — Abramowicz messages Butcher and asks if he's OK. He says "no," and asks how Johnston is doing. About 4 a.m. — Johnston says she's going to sleep in Belyea's room. About 4:15 a.m. — Abramowicz leaves Belyea's house. Belyea goes to his bedroom. About 4:20 a.m. — Belyea and Johnston are kissing in his bed when he hears steps coming across his kitchen. He testified he then feels a hand push his shoulder. It's Butcher. Belyea said he left his apartment to give Johnston and Butcher space to talk. When he comes back, both Johnston and Butcher are gone. He later he receives a Facebook Messenger message from Johnston's account: "Jesus f-----g Christ, I'm so sorry." About 5 a.m. — Harry Lehmann, a tenant in the basement of Johnston's Purcells Cove-area house, hears scuffling noises at the front of the house. About 7:30 a.m. — Lehmann hears someone coming down the stairs to the basement. He doesn't see who it is. Then, he testified, he hears a scraping noise and thumps as someone takes something upstairs. It sounds like someone dragging an extension cord. A short time later he hears a humming, mechanical noise. He thinks it is a microwave. It doesn't last long. 7:45 a.m. — Butcher calls 911. In the recording he's heard saying: "I need help. I'm dying. I'm bleeding to death. I cut off my hand. I killed her." A short time later police arrive at the scene and secure it. Butcher emerges from the house. His hand is severed, he has a wound to his throat and he is covered in caked-on blood. He says that he is sorry and is arrested by Halifax Regional Police Sgt. Matthew MacGillvray. "This is one of the most bizarre cases I've ever been on," MacGillvray said in a video statement played to the jury. Police discover Johnston on a bed with a pillow over her head. The sheets are soaked with blood and a black-handled steak knife is next to her body. A police officer also finds a severed hand in the bedroom next to a mitre saw. Around 8 a.m. — Paramedics are allowed on scene. They see Butcher lying on the front porch, his hand amputated and a deep cut on his neck. A paramedic retrieves his hand from the bedroom. 8:08 a.m. — A paramedic goes into Johnston's bedroom and pronounces her dead. 8:22 a.m. — An ambulance takes Butcher and his severed hand to the QEII Health Sciences Centre. On the way he begins screaming and asks someone to call his mother, according to MacGillvray, who was in the ambulance with Butcher. Butcher's hand is reattached at the hospital. Paramedics at the scene in the ambulance testified Butcher was calm. The jury saw photos of the crime scene that showed Johnston's body and "red" hand impressions on the bed. As well, the jury was shown exhibits that were seized from the bedroom, including a green lighter, a single razor blade, a package of razor blades and the black-handled knife. One of the doctors to treat Butcher at hospital, anesthesiologist Genevieve McKinnon, testified he said several times that he'd messed up. He appeared upset, remorseful and his eyes welled with tears, she said. Butcher, she said, was able to comply with her directions as she treated him. Surgeon Jonathan Trites testified there were 13 penetrating wounds to Butcher's neck — seven were close to the Adam's apple and six were at the jawline. He said if left untreated, the wounds could have led to Butcher's death. Marnie Wood, a medical examiner and forensic pathologist, told the jury in the third week of the trial that there were sharp-force injuries on Johnston's neck that severed her jugular veins, causing her to die of blood loss. She told the jury Johnston would have died within a couple of minutes, though it would have taken about five minutes for all the blood to drain from her body. Wood said Johnston's neck wounds were consistent with knife wounds rather than razor blade wounds. 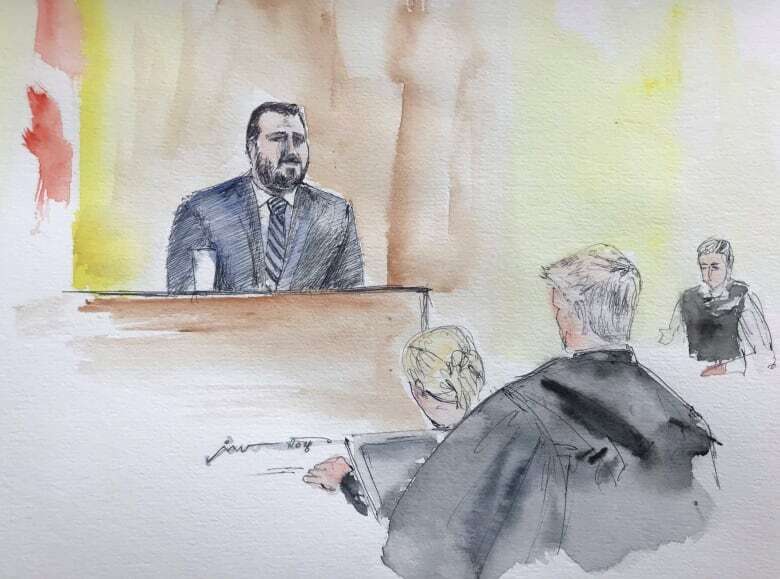 In response to questions from the defence, Wood said seven of the 10 neck wounds were cut wounds, which are longer than they are deep, and the other four were stab wounds, which are deeper than they are long. She testified it appeared there was a short struggle at the scene and that Johnston's hands had what appeared to be defensive injuries, as though she was trying to ward off an attack. In the third week of the trial, a toxicology expert testified alcohol was the only drug found in Johnston's system at the time of her death. 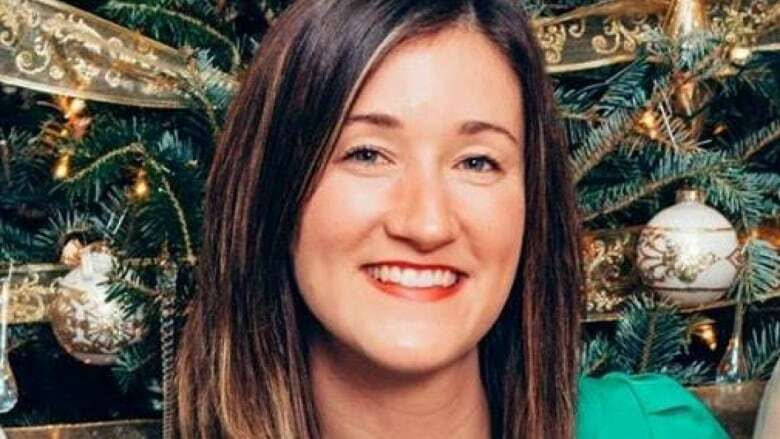 The toxicologist said Johnston's blood-alcohol level was double the legal limit for driving when she died and that any person with that level of intoxication can have trouble making sound decisions and recognizing risks, but may not give outward signs of being drunk. The jury also heard from an officer with HRP's forensic identification unit who told the jury in addition to the 10 wounds on Johnston's neck, she had wounds on both her hands. A forensic DNA expert testified the knife at the scene had both Johnston's and Butcher's blood on it.